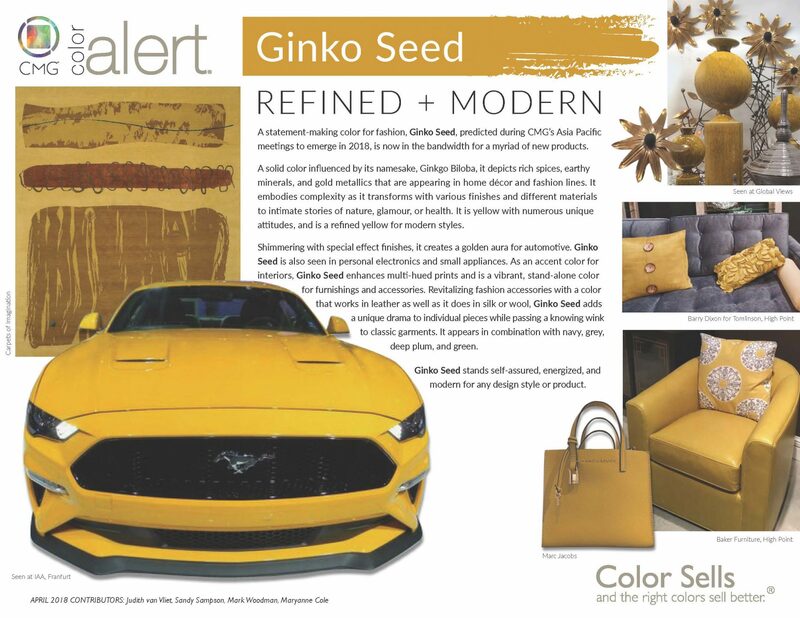 A statement-making color for fashion, Ginko Seed, predicted during CMG’s Asia Pacific meetings to emerge in 2018, is now in the bandwidth for a myriad of new products. A solid color influenced by its namesake Ginkgo Biloba, it depicts rich spices, earthy minerals, and gold metallics that are appearing in home décor and fashion lines. It embodies complexity as it transforms with various finishes and different materials to intimate stories of nature, glamour, or health. It is yellow with numerous unique attitudes, and is a refined yellow for modern styles. Shimmering with special effect finishes, it creates a golden aura for automotive. Ginko Seed is also seen in personal electronics and small appliances. As an accent color for interiors, Ginko Seed enhances multi-hued prints and is a vibrant, stand-alone color for furnishings and accessories. Revitalizing fashion accessories with a color that works in leather as well as it does in silk or wool, Ginko Seed adds a unique drama to individual pieces while passing a knowing wink to classic garments. It appears in combination with navy, grey, deep plum, and green. Ginko Seed stands self-assured, energized, and modern for any design style or product.